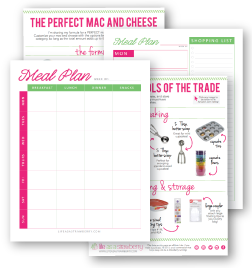 This post is part of my Cooking 101 Series! 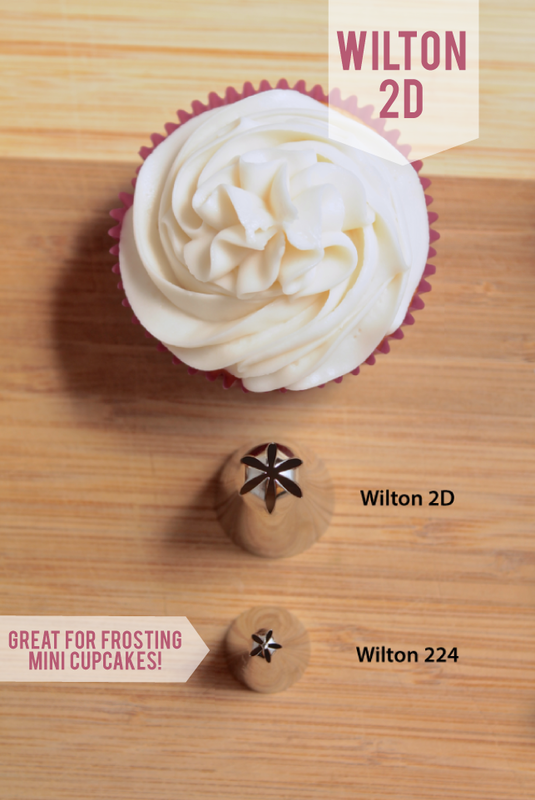 Welcome to Cupcakes 102: All About Frosting! This is part 2 of my 3-part series all about cupcakes. 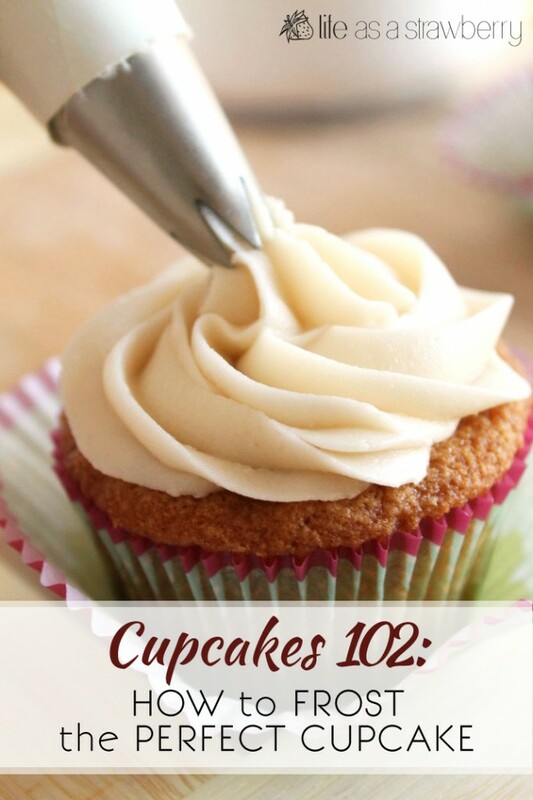 If you haven’t seen them yet, check out Cupcakes 101: 10 Tips to Bake the Perfect Cupcake, Cupcakes 103: 14 Ways to Decorate Cupcakes Like a Pro, and Cupcakes 104: How to Store and Freeze Cupcakes! Now that we’ve mastered the cupcakes themselves, it’s time to move on to frosting! 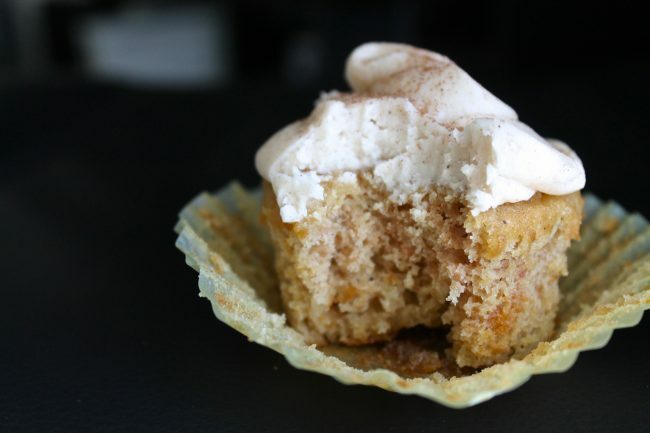 Which is probably the best part of the whole cupcake experience. 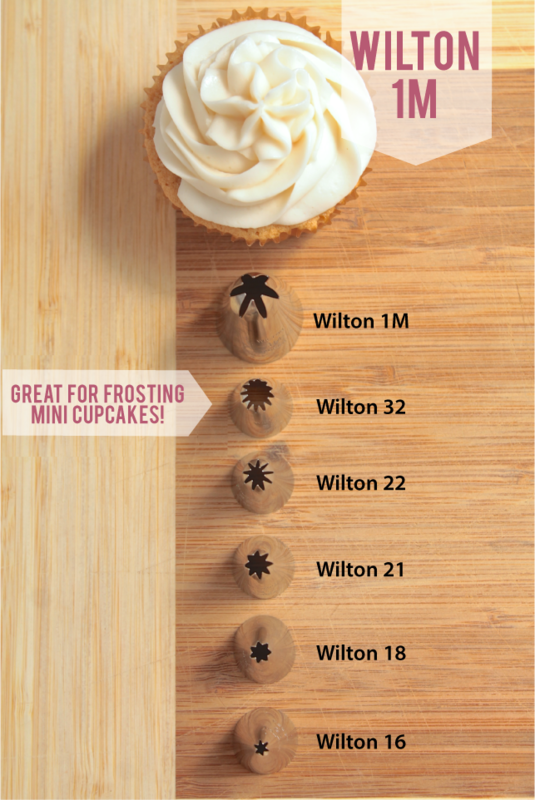 There are SO MANY OPTIONS when it comes to frosting your cupcakes. Personally, I have three go-tos: Vanilla Buttercream, Chocolate Buttercream, and Chocolate Fudge Frosting. If it’s a special cupcake, like my Pumpkin Ale Cupcakes, I’ll switch up the frosting and add fresh fruit, maple flavoring, or a bit of liquor (WOOT). With any frosting, it’s important to pay close attention to consistency. 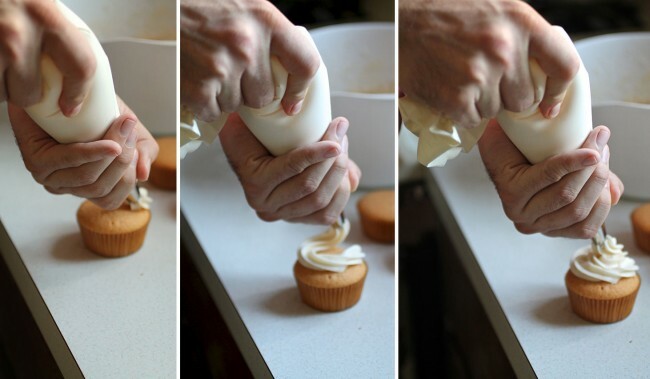 If you’re planning on piping the frosting onto cupcakes, your frosting needs to be stiff and able to hold its shape. When you mix, take a spatula and pull it through the frosting to form some stiff peaks. If the peaks hold without falling over, the frosting is probably thick enough to pipe. Fix too-thin frosting by mixing in more powdered sugar a bit at a time. Is your frosting ready? Good. Let’s start piping those cupcakes! Pictured: Roasted Peach Muffins. With frosting. Cuz I’m cool like that. PS – Special shoutout to Kyle for being my super awesome hand model in all of the action pictures! You da best. The first (and super-duper important!) 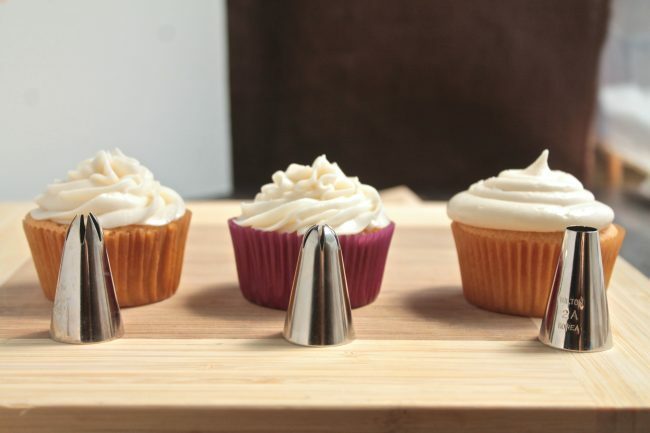 step to achieving professional-looking cupcakes is to master the art of frosting them. 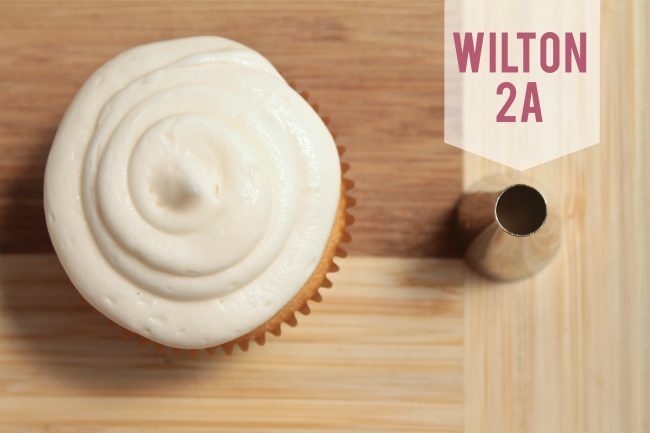 I use Wilton equipment for all of my baking and decorating – in my experience, the price and quality just can’t be beat. (I’ve also heard great things about Ateco products, though I’ve never used them myself). 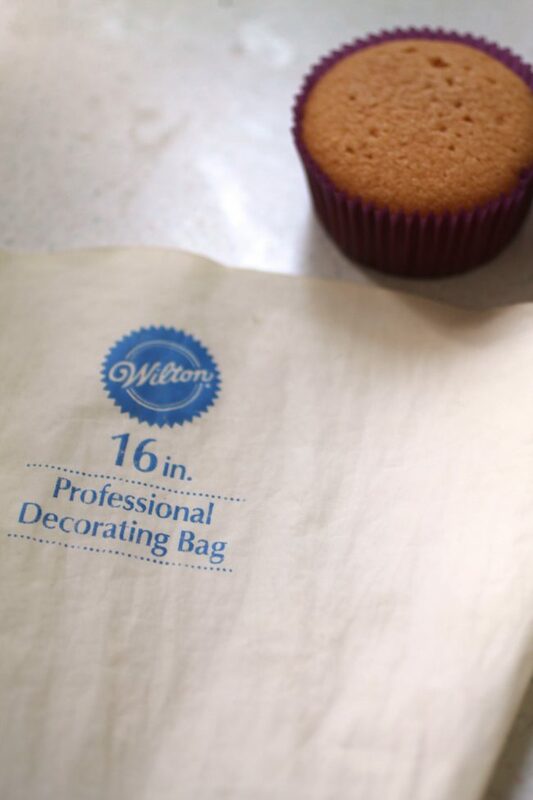 I use my favorite Wilton 16 Inch Pastry Bag for all of my cupcake frosting. It’s big enough to hold a substantial amount of frosting without being full to the brim (which results in a giant mess/frosting explosion. No fun). 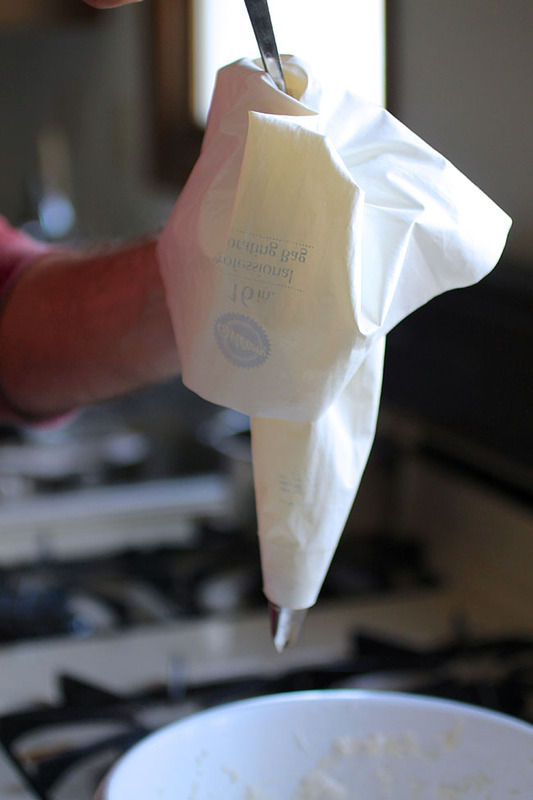 Hold the bag in your hand at the fold – this will give you the best support when you spoon your frosting into it! 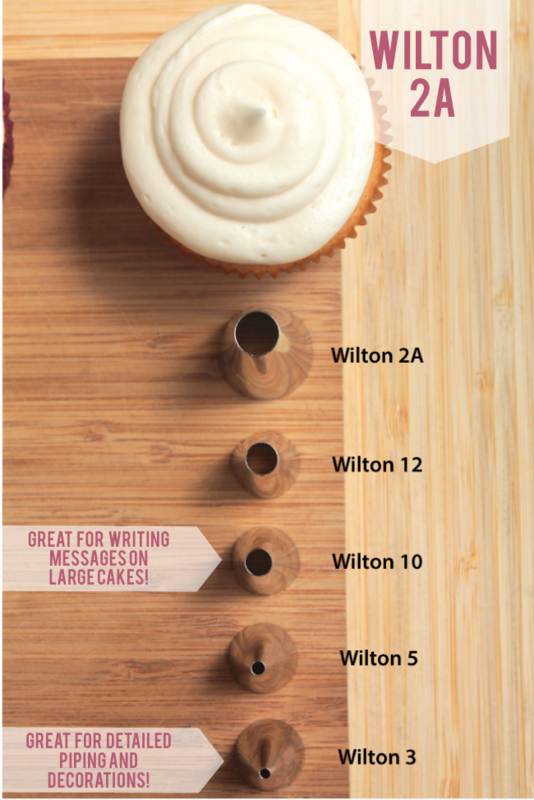 Attach your frosting tip of choice and you’re ready to fill your bag with frosting! (I used my vanilla buttercream in these photos). Scoop up a heaping spoonful of frosting, and use your spoon or spatula to push it all the way down to the tip of the pastry bag. Then, use the hand holding the pastry bag to squeeze the bag around the spoon and pull, to make sure all of the frosting gets into the bag. 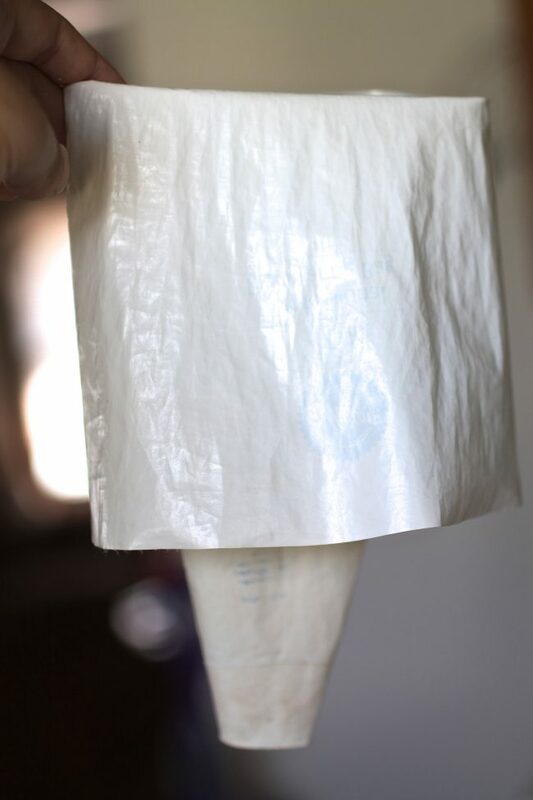 Pull the spoon out and repeat until the bag is full up to the fold. 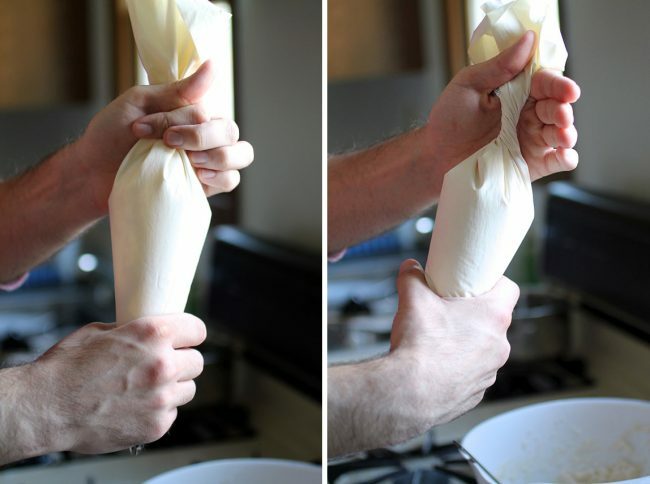 When you’ve filled the pastry bag up to the fold, pull the top half back up and run your hand down the bag to squeeze out any air bubbles between clumps of frosting. 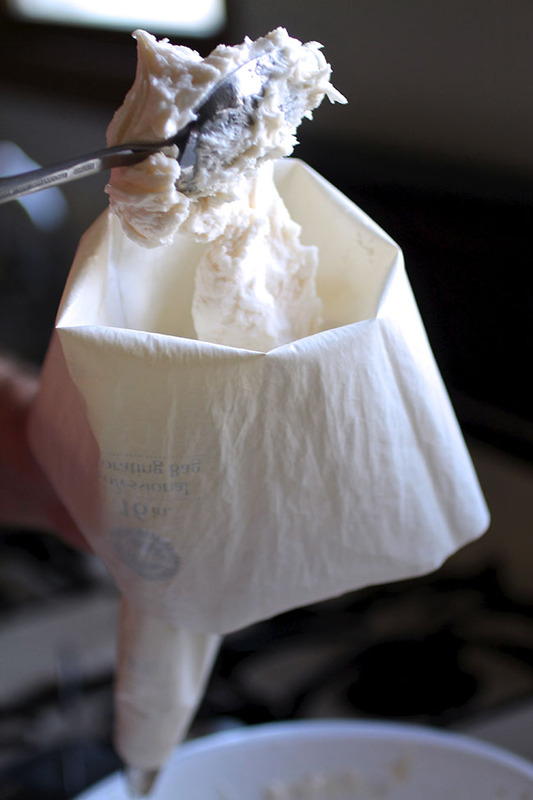 Then twist the top tightly so that no frosting will escape when you apply pressure to the bag. To frost cupcakes, point the tip of the pastry bag on an outer edge and apply even pressure to the frosting-filled part of the bag with one hand while using the other hand to keep the top of the pastry bag tightly twisted. Move in a circle around the outer edges and work your way to the center of the cupcake, releasing pressure gently when you reach the center to leave a nice frosting peak. Ta-Da! A beautifully frosted cupcake. Looks super profesh, no? And it took all of thirty seconds. Pastry bags are great for beautifying your cupcakes, but they are also the unsung heroes of cupcake time-saving: a pastry bag makes it SO easy to frost a large amount of cupcakes quickly and prettily. 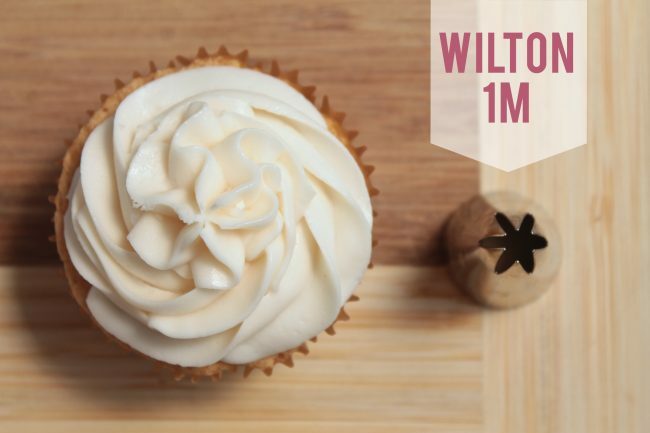 The Wilton 1M (Used in the frosting how-to photos above) is my most-used tip for cupcake frosting. It creates a nice, thick swirl and looks very uniform (read: mistake-free) no matter how quickly you are frosting. 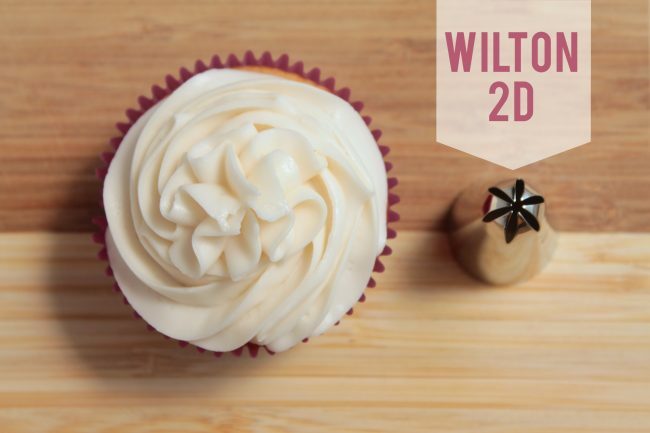 The last tip I use for cupcake decorating is the Wilton 2A. This is a very standard tip – just a large, round shape – and it’s great for using with elaborate toppers and ganache that would overpower swirly frosting. Hungry for more cupcake tips? 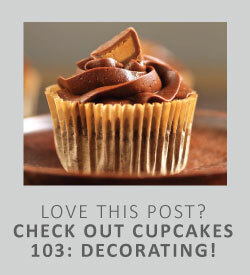 Check out Cupcakes 101, Cupcakes 103: 14 Ways to Decorate Cupcakes Like a Pro, and Cupcakes 104: How to Store and Freeze Cupcakes! I love making cupcakes! I wanted a whiter frosting so I used Whittaker white vanilla. The frosting had a horrible plastic taste. Any suggestions? Hello! So glad it helped you out, thank you! I have a question. If i wanted to make a vanilla-raspberry buttercream, and cooked some frozen raspberries down, could i swirl that through the buttercream without causing it to break? Or put it along the edge of a piping bag to have it naturally swirl as i frosted? Hi My name is Toni and I just started reading you cupcake tips. They are amazing. My and my niece are starting our own business and I had a question. How do we prepare the cupcakes for delivery?